From my collection, it seems the Dutch have been the ones to favour stamps with only the denomination printed, though these stamps from around 1899 have a bit of flourish to them. so, when this stamp arrived in my mail this week, I assumed at first it to also be Dutch. 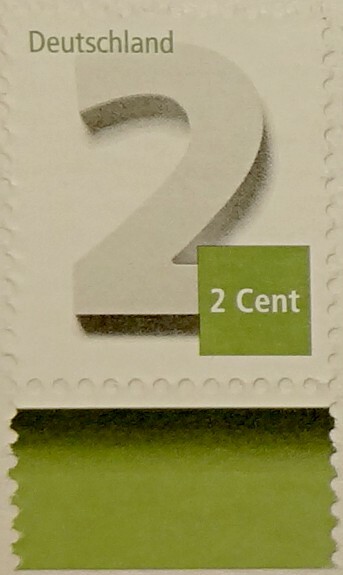 There is no date on this German stamp, but I believe it to be a 'supplemental 2 cent' stamp for use with older issue stamps when the price increased in 2015.
which is far easier to deal with than our 22¢ supplemental stamp! I thought this was such an interesting theme this week. So many interesting examples. I like the 3D look to the German 2. I'm glad – I was almost worried it might prove too challenging! But there are more lettered stamps out there than I knew about. I agree with both of you: it has been interesting, and challenging! I also think the Dutch issue more stamps with just numbers than other countries. But this opinion is probably due to the fact that a big amount of mail that I receive comes from the Netherlands. I used to think these stamps were boring, but the more I look at them, the more I've learned to appreciate the intricate details. The oldest Dutch stamps I've never seen! From the brown '3' serie I know the 5 cents, which had an orange background instead of brown, and which I remember as a child: it was used a lot in the seventies. The 25 (guilder) cent stamp is from a more recent serie, but since the introduction of the euro it has been replaced by the (also suplemental) ones Eva has posted today. The German stamp is nice, too! I was surprised at how old those stamps were! They were among many hundreds in an album I bought. Surprising how many of this week's theme have been issued, once one starts to look, everyone, including me, seems to have enjoyed this challenge. I like the variety in the Dutch numbers, I rather liked those 76-82 ones. and everyone posted different stamps! My few Netherlands stamps include a red 50 C which looks similar to the blue 25 C you have shown. This has been a very enjoyable theme - but next week's is a real challenge. oh dear, and I thought with the theme for the 2015 Europa stamps being old toys, this might be easier for most of you.